Free Printable Adverbs List. Free Printable Adverbs List, a very useful 129 adverbs word list ready to print. Great for school or homeschool, quiz, dictation, spelling and more. Great educational resource for kids at school, homework, projects, etc. Just print all the copies you need with your home laser or inkjet printer. The Adverbs List is great for parents and teachers use. Adverbs are words that change or simplify the meaning of a verb, adjective, other adverb, sentence or clause, like absolutely, happily, indeed, however and many more. The student can write the name, class, date and teacher information in the document. 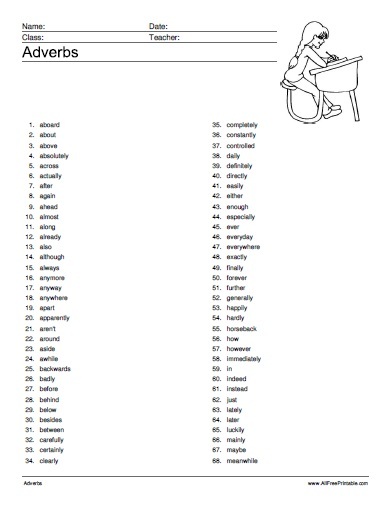 Click the link below to download or print the Adverbs List with 129 words now in PDF format.